strings and purls: It's Dishcloth Knittin' Time~~~Yippee!! Like the Pic?? 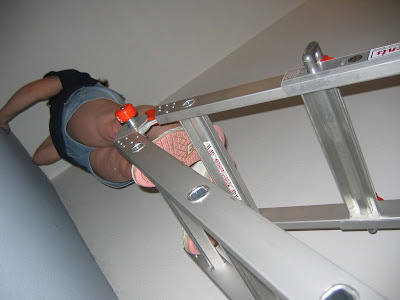 That's my friend Kathy's daughter working on the ceiling line in my foyer. And yes, the photo was taken looking UP the at soles of her shoes. There's a very good reason it's not my shoes you're seeing in this picture. Plain and simple: I'M CHICKEN! That corner must be about 18 feet up over a stairway, and just standing guard and handing her things made me hold my breath. It's not that I'm afraid of heights, it's just that I like to feel secure and firmly planted. Just another reason to be a teacher and not a house builder!! The good news is, the foyer is done, except for a few last-minute details, and it looks great! I went for a big change, and I'm gonna love it! As I type, I can hear the sound of DH running his sander as he prepares the woodwork. Some is being refinished, and some is being replaced--it will be beauteous!!!! Oh good god that picture made me dizzy just looking at it. ACK!